Camp dutch oven pot roast cooked over an open fire. I do all of my camp dutch oven cooking over a campfire (as opposed to using charcoal briquettes). To my mind, charcoal briquettes are just one more thing to buy, another thing to pack, and are loaded with additives like coal dust, sodium nitrate, borax, parrafin, and other petroleum products. 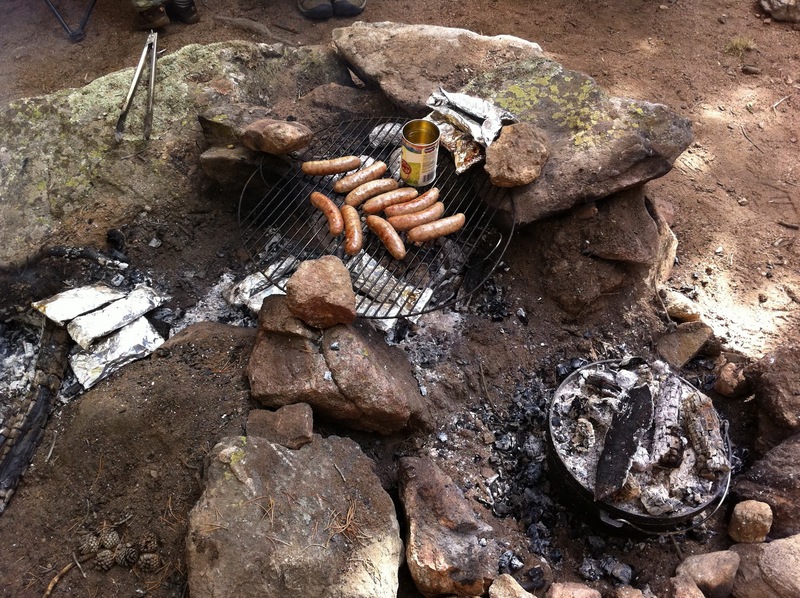 If you search around for camp dutch oven recipes, you'll find that the vast majority of them use charcoal briquettes. But these days, a lot of home barbequers (myself included) are using hardwood lump charcoal instead of briquettes. These real-wood glowing coals are exactly what you'll harvest from your campfire for dutch oven cooking. Begin by preparing two fire rings. The first ring is for your "coals" fire, from which you'll keep pulling fresh hot coals to heat your dutch oven. The second fire ring is your "cooking" fire, where your dutch oven will sit and cook your food (see image at right for an example). Depending on where you're camped (and the flammability of the ground surrounding your fire pit) your "cooking" fire ring may simply be a patch of ground next to the main fire ring. If you're in a developed campground with one of those metal fire-ring-grill-combo thingys... you can usually plunk your dutch oven on a corner of the concrete pad on which the fire ring sits. 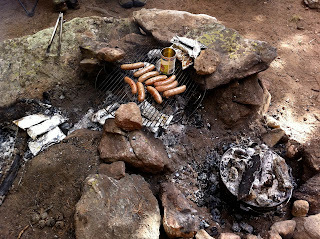 Once you've prepared your fire rings, make a large fire in your "coals" fire ring. Use smaller pieces of very dry wood to start this fire. The idea is to quickly develop a big pile of hot coals to put above and below your camp dutch oven. A large fire made of sticks (as opposed to logs) is the quickest way to develop a large pile of hot coals. Hardwood is better than softwood since the coals last longer. Out here in the west, the closest things we have to hardwood are locust, aspen, and cottonwood. Pine or other softwoods are also fine (you'll just have to replenish the coals more often). I often end up cooking with ponderosa pine and things work out great. 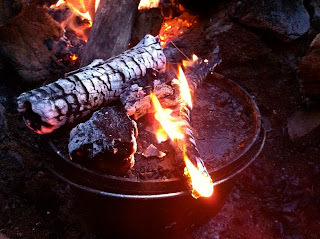 Once your "coals" fire is established and you've placed your initial pile of hot coals above and below your dutch oven (more on that in a sec) you can add logs to the "coals" fire to keep it burning more steadily. Of course, you may also choose to grill parts of your dinner (burgers, steaks, bratwurst, fish) over your "coals" fire, in which case you'll hold off on the logs until you're done. When I'm making a recipe that involves a few hours of cooking, I prefer to make my initial fire in the "cooking" fire ring where I will eventually place the dutch oven. This warms the rock and soil, and helps provide more even heat. This means, of course, that you'll move your fire from one ring to the other. Moving the fire isn't as hard as it sounds, but if it seems like too much, don't bother. Dutch oven cooking involves applying heat from two directions (the bottom and the top). It's important to also rotate the base and lid periodically to even out any hot spots. The goal is to simulate the even heat of a real oven. Most dutch oven recipes call for approximating a 350 degree F oven. Depending on what you are cooking, you may apply more top or bottom heat. For boiling or deep frying, you'll apply all of your heat from the bottom. For making chili, stew, or other high-liquid dishes, put most of your heat underneath, and a little bit on top. If you're making pot roast, you'll split the coals pretty evenly between top and bottom. If you're baking crisps, cakes, or enchiladas, you'll put the majority of your coals on top, and just a few underneath. For baking, you'll be preparing your meals in the cold dutch oven and applying heat once things are ready. For pot roast, soups, stews, and chili, you'll likely be browning meat, caramelizing onions, or doing other tasks in the hot dutch oven base prior to adding the rest of the ingredients. Whatever you do, before adding food, make sure your camp dutch oven starts shiny (coated with oil). To begin heating the dutch oven, grab a single layer of coals from your main "coals" fire, and sprinkle them into the second "cooking" fire ring in a disc that roughly matches the diameter of your dutch oven. What you are doing is creating a "burner" for your dutch oven. The thickness of this burner depends on how much bottom heat you want. For boiling, it should be packed full and 2 inches deep. For simmering, maybe 1 inch deep and somewhat loosely packed (there should be spaces between the coals). For roasting and baking, start with just a few sporadic coals, and add more once you confirm that your food is not burning (more on that later). Place the camp dutch oven on the disc of coals. If you're making a pot roast or chili, you'll probably keep the lid off and do some browning and searing first. Once things have settled down and you're ready to place the lid on the dutch oven, go ahead and pile some glowing coals on top of the lid. For boiling, you'll probably skip the top coals altogether. For stewing and simmering, place a few coals on top to help move things along. For roasting, you should have a 1-inch pile of coals that mostly cover the lid. For baking, you'll pile the coals up to 2-inches high and cover the lid thickly with them. It's also fair game to pile a few medium-sized flaming sticks (see picture above) on top instead of coals. You have to be careful of hot spots (more on that below), but sometimes this approach is easier than messing with a bunch of smaller coals. The #1 mistake of camp dutch oven cooks is applying too much heat and burning the food. To avoid burning your dinner, check on your food frequently (at least every 5 minutes). This is especially true in the beginning when the first data points about how hot your fire really is are trickling in. 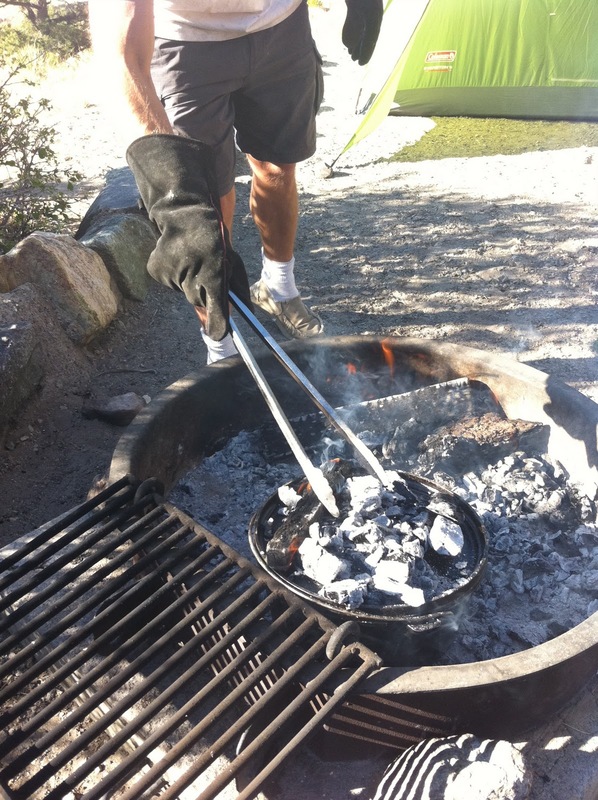 To check your food, lift the lid off (coals and all) with a pair of long-handled tongs. Place the lid on a clean surface so you don't end up with dirt or ashes in your food after replacing the lid. I usually use two smaller logs laid next to each other as a lid rest. With the lid removed, visually inspect the food for any signs of burning, and try to get your nose down there to smell for any burning-food-type odors. Vigorous bubbling means your food is already burning or is about to burn. I usually reach into the dutch oven with a wooden spoon and dig to the bottom to make sure nothing's burning or sticking (sticking is a precursor to burning). If you're cooking something like chili or pot roast where stirring is no big deal, performing these burn-checks is easy. If you're making a crisp or a cake, you'll have to rely mostly on scent (that said, a little inter-mixing of layers is far superior to a burnt crisp). When you're satisfied that nothing is burning (yet), rotate the base of the dutch oven by 90 degrees, and then place the lid back on top. When you place the lid back on top, rotate it by 90 degrees in relation to the base. Here's a tip: If you pick up the lid and put it back in the exact same orientation, when you rotate the base underneath it you'll have effectively rotated the lid in relation to the food. Don't worry too much about proper rotation as long as everything looks and smells fine inside. Always err on the side of too little heat as opposed to too much. If, upon checking your dutch oven, nothing is bubbling and everything seems to be getting colder, go ahead and add coals. Never be afraid to remove your dutch oven from all heat (pick it up by the wire bail and set it on cool ground). With a little experience, you'll get the hang of how much heat is needed and you won't have to check on your food as much. I use an 8-quart Lodge camp dutch oven. It's big enough to handle meals for 6 or 8 people, but not so huge as to take up half the car when packing for a trip. The lid doubles as a frying surface in a pinch. I've posted more information on dutch oven care, cleaning, uses, and more on my camp dutch oven equipment overview page (warning: dork alert!). When doing any campfire cooking, I use a pair of leather welding gloves with a good-sized gauntlet to protect the wrist. 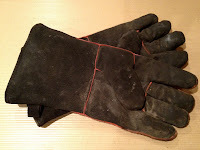 They're not cheap (up to $40 a pair), but they beat the pants off kitchen oven mitts when working around a campfire. It is a real bummer to burn your hands when you're out in the wild. It's an even bigger bummer to drop your dinner into the dirt due to burnt hands. 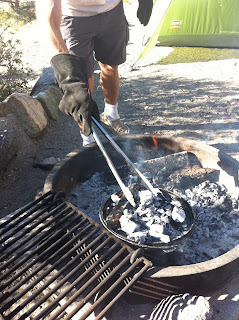 In campfire cooking... as in life... a good pair of gloves is a purchase you'll seldom regret. I use two pairs of long-handled tongs when I cook with the dutch oven. One pair is for moving hot coals, logs, and lifting the lid of the dutch oven. The other pair is for touching food. The tongs I use are 16 inches long. I've found that tongs made for grilling & barbecue are sub-par compared to restaurant utility tongs. Restaurant tongs are stronger, and have a better spring mechanism to keep them open without extra effort. I got my tongs at a restaurant supply house. They have a website with online ordering, so you can buy the tongs online if you can't find them locally (no, I don't get any kickback). 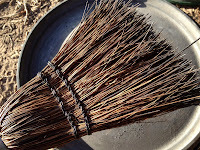 The whisk broom is really handy for removing coals and ash from the top of your dutch oven prior to serving. This helps keep unwanted junk out of your food. Be sure to get a non-plastic whisk broom, since plastic will melt when it comes into contact with a hot dutch oven. 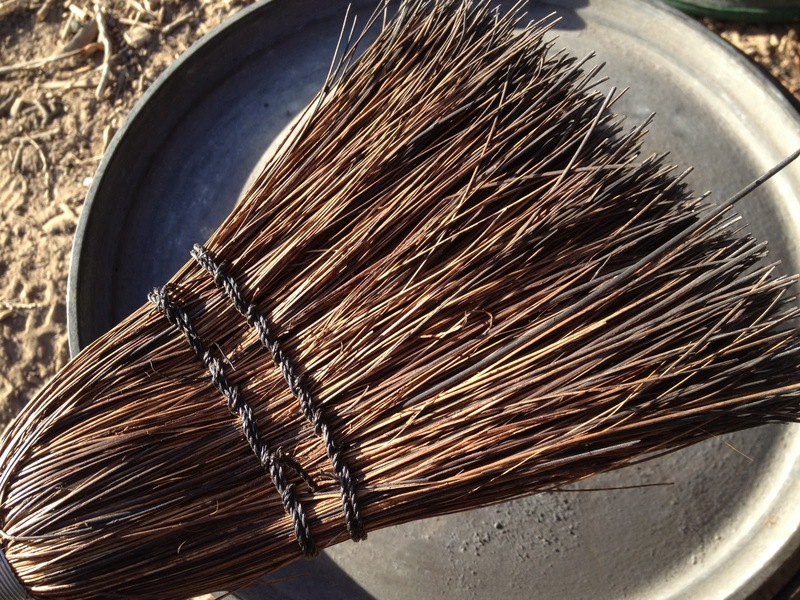 In a pinch, you could easily make a simple whisk broom from some dried grass stems and string. Initially, I felt a little silly purchasing a dutch oven carrying case. But a trip last spring to the slickrock desert outside of Moab, Utah cured me of my gear-fear. A camp dutch oven should always be put away well-oiled, and sand will stick to it in a hurry! Every night on that early spring trip to Utah we had blowing sand and dust. The dutch oven was ready to go first thing in the morning only because it had been protected by the carrying bag. One item of convenience I'm thinking about buying is the metal "watering pan" some people use for DO cooking. They're a lot cheaper than DO specific tables, but they are galvanized. Have you heard anything about that being a problem? It's just that our usual campsites have fire rings chocked full of ashes. Cleaning them out for cooking is often a messy pain, and scooping the ashes to the side just means that ash will fall into the food at some point during cooking. Your thoughts? I have not heard of problems with using a galvanized pan. My guess is that the galvanized coating will burn off and eventually the thing could rust... but this probably isn't that big a deal. I typically put the dutch oven on the ground to the side of the fire pit, and load coals above and below it from the fire ring. It sounds like you can't just set the dutch oven on the ground... so yeah, some sort of metal pan should work great for the "cooking" fire ring. An old metal oil pan would also probably work great. Let us know what you decide... and how it works out! Would it be okay if I copied some of the article to use as a handout. Full credit would be given to you. Sounds like a great gathering! Please feel free to use parts or all of the article as a handout for the gathering. Thanks for asking, and thanks in advance for attributing the article. I'll have to make it out to Branson one of these years! Thanks so much for your very informative site. Bookmarking so I can take it all in. I feel I can do justice to my new dutch oven now. You're welcome... and thanks for stopping by. Glad you feel well-prepared to use that new dutch oven. Enjoy! One thing...the tongs. I don't feel they would be strong enough. I had a pair of "industrial strength" that gave out on me during wood stove cooking. I think I will go with the deluxe lid lifter I found online. I felt the same way as you until I got out there and used both tongs and the "real" lid lifter. I found the lid lifter to be just one more thing to keep track of around the fire... which made it a pain (for me) since it was a single-purpose implement. If you get a good set of long-handled restaurant tongs, they are plenty strong. But each dutch oven cook should figure out what works best for them... and go with it. Let me know how it goes once you hit the woods with that dutch oven (and lid lifter)! I always love to hear peoples' stories from the field. This is an amazing article! Our family is just getting into camping and I am going to follow your directions as precisely as I can. Thank you so much for taking the time to detail everything out for us! Thanks for the kind words. Please let me know if you have any questions once you get out there and try it. Thanks!